Note: You can use any type of meat you want, or make it vegetarian. Use beans or sauteed squash and onions in place of the meat. around 16 corn tortillas, the smaller 6" size is best, but the bigger ones are OK. I used alternating blue and white corn tortillas in each stack. Heat the salsa over medium heat, then add the chipoltes and mix well. Add the raisins and pine nuts, cook for 10 minutes over low heat. Set aside. Heat enough oil in a skillet, over medium high heat,to soften the tortillas--about 1/3 cup. Cook each tortilla on both sides until they are lightly crisp around the edges, drain on paper towels as you finish them. Make each stack on a baking sheet by layering 4 tortillas, with chicken sauce and cheese between each layer. End with a tortilla and drizzle sauce on top, with some cheese. Bake the tortillas in a 350 degree oven, for about 10-15 minutes, until the cheese has melted and the stack is heated through. Serve garnished with the cabbage, radishes, and cilantro. Serves 4 -6 people, depending on whether each person eats a whole stack or splits it. Now that's a party you've got here! We don't here much about Cinco de Mayo up here but I hope that will change soon! happy cinco de mayo! 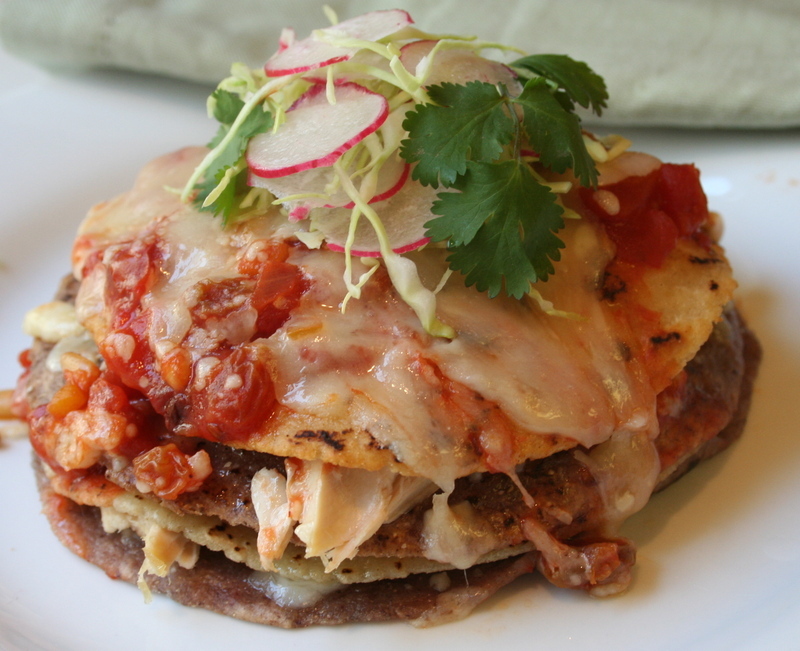 I belive I saw an enchilada stack on your blog last year and craved it. I've never made this dish or eaten it but your pictures make me want to try my hand at them. Are raisins typical in this dish? I'm off to lunch now, Sher - too bad I won't find anything delicious like this over here! This makes me very excited for the Cinco de Mayo party my family is having tonight! I'm the same as you, though - I don't usually need a reason to eat Mexican food because I love it so much! Beautiful presentation! I love the radishes on top -- reminds me of The Night of the Radishes in Oaxaca -- oh so Mexican a celebration. mmmmmmmm Happy Cinco de Mayo! Interesting addition of raisins and pine nuts. I might have to leave out the raisins, but otherwise this looks like something my family would enjoy very much! Please I need a Mexican fix. I'm always surprised that I like raisins in a savory dish like this and the golden raisins are the only ones I'll use. This is beautiful. That looks really good. Now I am craving texmex flavours! Looks great! Nice pic as well. Good Holy God. I'm flying to Davis tonight. And when I get there, I'm lookin' for your house. OK, I'm hungry now -- and I just ate! What a wonderful way to celebrate Cinco de Mayo, and pretty easy-peasy, as well.